SM DEPARTMENT STORE - Philippine Fashion Week Holiday 2011 Collection! It's this time of the year when a feeling "fashion fashion" person like me gets to dress up a bit and attend a fashion show! Last year I was able to attend the Philippine Fashion Week Summer Collection by SM department store. And I was able to get tickets again for this year but unfortunately I was too late to get there on time!!! I thought that the show would start like last year which is -- fashionably late! I heard that it started late but not as late like last year. So after two long hours of commuting, I arrived to an ALREADY finished fashion show. I wanted to cry! I didn't though and resigned by my fate decided to just take photos of the Parisian Shoe Display outside the room where the fashion show was held. But all was not lost! People, THERE IS A GOD! It was as if He knew just how to cheer me up coz I was able to get a Parisian Gift Voucher! Ty Parisian! :) LOVE LOVE IT! 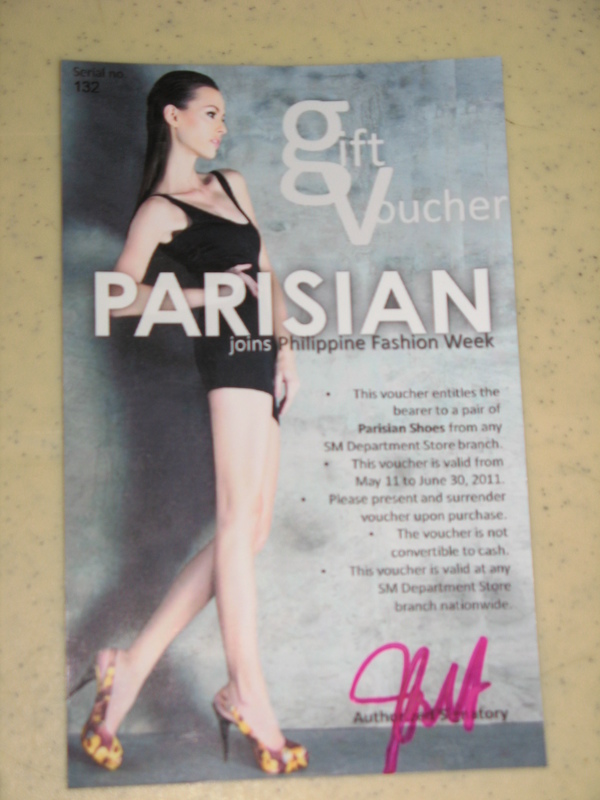 A Parisian representative noticed that my friends Jen, Rache, Naomi and I were wearing Parisian shoes and because of that, we were able to get a gift voucher thanks to Parisian! Thank you Laura and SM Parisian! AND WITH THAT, I was able to happily take a lot of wonderful photos of the lovely Parisian shoes. Check em out -- Color Blocking, Summery Colored Prints, Animal Print, and the Sparkling dance shoes (thats what I call the silver and gold ones!). Its all about the heels dear!!! Color Blocking pumps and Summer inspired pumps! I just love the richness of the color and the print! The lighting is a bit bad... but it is actually TAN. Of course love the peep toe and the fact that its BLACK & WHITE! ANIMAL PRINT = FIERCE LOOK! LOVE IT! Because we weren't satisfied with the few that was displayed, we went to the SM MOA's Department Store and checked out the Parisian Philippine Fashion Show Shoes Display. I snapped a few stolen photos of the display there.. shhhh.. sorry I couldn't resist! Animal Fierce WITH Color Blocking! TOTALLY LOVE THIS! I don't know if I can handle that heel though! LOL!!! And so there we have it! The SM Department Store Fashion Show that we missed still turned out to be a fun photo shooting day with Parisian Shoes. With Naomi - my bestfriend since highschool - wearing Parisian boots! To my delight, I later found out that I was going to attend the Cyber Shot Luxewear Fashion Show and Oxygen Clothing Fashion Show all thanks to Ate Jen! :) Love you cuz! Next batch of photos of the Philippine Fashion Week shows will be posted later on this week. I'm starting to work now so sked is super hectic! @ Hazel: I don't even know which shoe I should get! There are so many pretty things to choose from! !